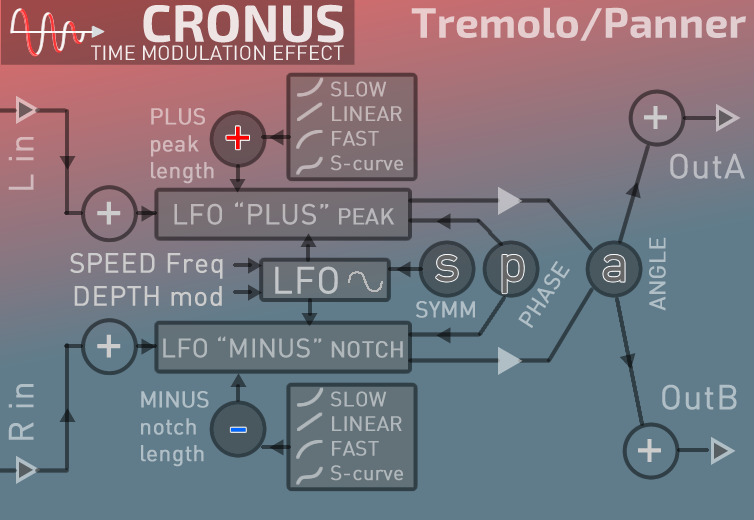 Introducing **CRONUS**, a new time-modulation effect that includes 3 effect types in one: Chorus, Flanger and Tremolo. All of these effects are time-modulated delay effects. When guitarists talk about modulation effects, they are referring to effects such as Chorus, Flanger, Tremolo, Vibrato and other delay based effects. For example, Tremolo produces effects that are described as “lush, warm, and roundly pulsing. We have combined these in one box to save you from having to use them individually. 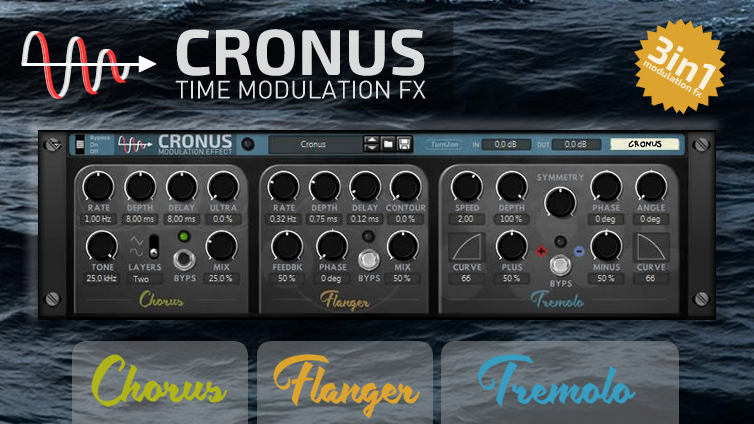 CRONUS is a very easy and useful effect for your Reason rack. 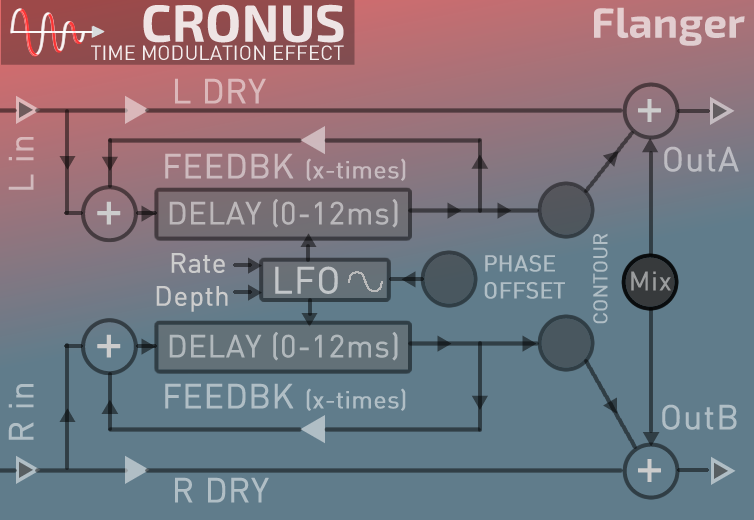 of them are based on delay effects with a relatively small range of delay. 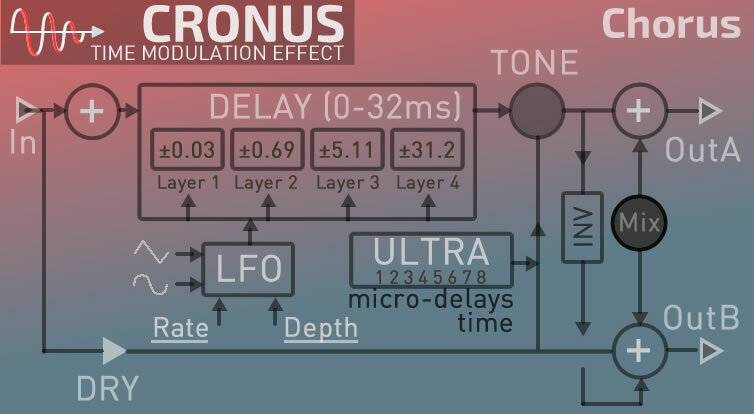 We decided to enhance these delay-based effects with LFO modulation for the Delay effects to create special sounding effects. The LFO has **RATE** and **DEPTH** settings. The output produces a sound in which several sources play the same sound, but with some changes, which eventually sounds like chorus. When mixed together with the main audio signal, it creates an effect which sounds like multiple instruments are being played at the same time. The Effect takes the audio signal and mixes it with one or more delayed copies of itself (**LAYERS**). Delays of the added voices is typically modulated by LFO. The two chains are modulated by one LFO and delay with detunes. Then the Left and Right channels go through **TONE** and **ULTRA**. Additional Micro-delays (ULTRA) create a wider and more intensive parallel delay line. After this, the sum of the signals from one channel and dry input is **inverted** and is sent to the second channel, where the sum of channels (**MIX**) can be adjusted. A delay processor sends the input signal to the output at a later time which is set with the DELAY time. The delayed signal is combined with the original signal with the **MIX** parameter. The number of delay repeats is determined by a **FEEDBACK** control (more feedback = more repeats). The Flanger as a stereo-effect has a **Phase Offset**, which is an offset between the left and right modulation. The Flanger effect originated by using 2 tape machines in sync mode. When the sound became unsynced, it created delays and sound engineers discovered a new time-modulation effect – the Flanger. Usually a flanger is referred to as a jet-plane effect. Classic Phaser effects do not have a delay section, but two phasers with unsynced delays is a standard flanger effect. You can modify the sound further, creating a comb-filter like effect, by manipulating the speed (**RATE**) in addition to the phase. Tremolo is a modulation effect that rhythmically changes the volume of your signal. An LFO (low frequency oscillator) is used to create a waveform that turns the signal volume up and down (“plus” and “minus”). Using sine-waves produces a lush, strong tremolo. It is similar Vibrato effect which modulates pitch, while Tremolo modulates the amplitude. Tremolo is more useful for creating percussive shuddering or stuttering, as well as intense pulsating effects. **SPEED** adjusts the frequency of the LFO and can be synced to the tempo of your song. **DEPTH** sets the limit of volume/pan of the effect, varying from subtle to completely deadening of the signal. **SYMMETRY** controls the shape of the LFO waveform. At 50% the waveform is perfectly symmetrical. At 0% the waveform shifts to the “PLUS” zone, while at 100% it shifts to the “MINUS” zone. The **PLUS** knob controls the attack-length of the PLUS-zone, while the **MINUS** knob controls the attack-length of the MINUS-zone. **PHASE** adjusts the initial phase modulation difference between the left and right LFO waveforms. **ANGLE** adjusts the phase of the right channel relative to the left, to add stereo width and create an Auto-PAN effect.